On a stately, tree-lined street, not far from roads named for famous composers, lives a music legend. Frederica von Stade moves comfortably across her big, breezy kitchen to the whistling tea kettles and pours a cup of morning nectar for the voice — and the soul. Outside, the Tibetan prayer cloths hanging on the balcony spread their blessings over the house, a century-old Tudor with all the charm you’d expect for a star of von Stade’s stature. But what you don’t expect is her zest for simple living. “Call me Flicka,” says the woman with the warm mezzo soprano voice. I brushed any connection to horses out of my mind. I was wrong. “I was named after my father’s polo pony,” she smiled. “The show, ‘My Friend Flicka’ was big at the time.” This could explain von Stade’s strong connection to animals — she has several dogs and cats in the house these days. Just part of the family that includes five children and two grandchildren that comes and goes. For 35 years, Flicka has captivated audiences all over the world as one of the great opera stars of our time. Her life with the Metropolitan Opera has been a whirlwind of performances, on stage and on broadcasts. But as she approaches 60, Flicka finds her greatest joy is staying home. The harmony she creates with her husband, Mike Gorman, (one of the founders of the Bank of Alameda) matches that of any symphony. So we sip from our mugs and chat like girlfriends about family and music and the incredible, resilient spirit. “I have a singing lesson later today and then lunch with my daughter,” Flicka says, noticing the surprised look on my face. A woman with six Grammy nominations and dozens of recordings takes voice lessons? “She’s a marvelous teacher named Jane Randolph, in the Oakland Hills. She knows the true nature of singing and all its wonder — its lightness, its relation to the soul,” she says, almost dreamily. As the light streams in through the adjacent sun-porch, I notice a green bicycle — a beach cruiser splashed with white paint. “I love that bike,” Flicka shares. “I did that because I was afraid someone would steal it.” Then she showed me the “golf bag” Mike fashioned out of duct tape and PVC pipe near her back fender. A 20-minute ride and she can play the short nine and Alameda’s public course. “Golf is like singing,” says the woman who would know better than most. “Between addressing your ball and the back-swing are probably 5,000 thoughts and between standing on stage and hearing the first chord of the piano are about 5,000 thoughts. Your job is to control those thoughts.” No problem with the singing, but Flick admits that golf gives her fits. “My game is so horrible, I don’t want to blow a hundred bucks on a private course,” she laughs. 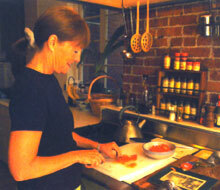 Cooking is another hobby that many singers enjoy. It comes naturally to Flicka, who’s mother was a caterer. “I can cook fo the masses,” she laughs. “And I do, every Sunday when the kids come over for dinner.” You can almost hear the laughter as you look at the long dining room table, adorned with a handmade centerpiece from one of the grandchildren. “Mike does the barbecue and I try out vegetarian dishes on everyone,” she says. After dinner the family retires to the music room to hear Flicka sing, right? Wrong. “They’re tired of hearing me,” she laughs, adding she saves that for house concerts she hosts as fund-raisers. A favorite charity is the alameda Education Foundation, which subsidizes music in the public schools. Flicka also supports programs that provide music for at-risk kids. “I don’t know anything about how to solve some of the problems in this country, but I feel strongly that if we begin with children, we have a chance,” she says. As the singer cuts back on traveling and performances, she sees herself teaching music to pre-schoolers and teens. With a life so rich and full of people and activities, where does a renowned opera start find time to practice? “I sing around the house all day” she reveals. Even on the treadmill. “I learn music during my morning workouts — so I won’t be bored out of my mind.” An hour of singing opera on the treadmill and anyone else would be thinking oxygen, not breath control.